As world demand for food rises, farmers are hard-pressed to work their land more intensively. This contingency, however, has a down side: soil is finite and organic; only so much can be asked of it. The ongoing use of chemical fertilizers, herbicides and pesticides take their toll on soil, as does plowing. Of course, farmers understand sustainability and many employ alternative treatments like organic fertilizers. More farsighted growers consider hydroponic farming, i.e. growing plants in a nutrient solution without the benefit of soil. Growing food with zero negative environmental effects is a future difficult to challenge. You do not have to be a commercial farmer to consider hydroponic farming. Smaller scale hydroponic gardens are not difficult to construct. The Wick System – roots grow in a thin layer of soil, perlite or coco atop a lower reservoir of nutrient-rich solution. The nutrients are drawn to the layer by means of porous wicks. The Water Culture System – roots are directly immersed in the solution, which is oxygenated by an air pump. The Ebb and Flow System – also called the flood and drain system. In this method, a water pump saturated the roots with the solution and then causes the water to recede. This procedure is usually regulated by a timer. The Drip System – is the most popular option. Like the Wick system, the roots are growing in a medium above the solution tank; unlike Wick, they are irrigated from above by elevated water jets attached to a timed water pump. The NFT (Nutrient Film Technique) System – the solution flows constantly from the tank into a growing tray and back out to the tank, as the roots take in the nutrients. The Aeroponic System – the roots are actually suspended in the air while receiving the solution in the form of mist. 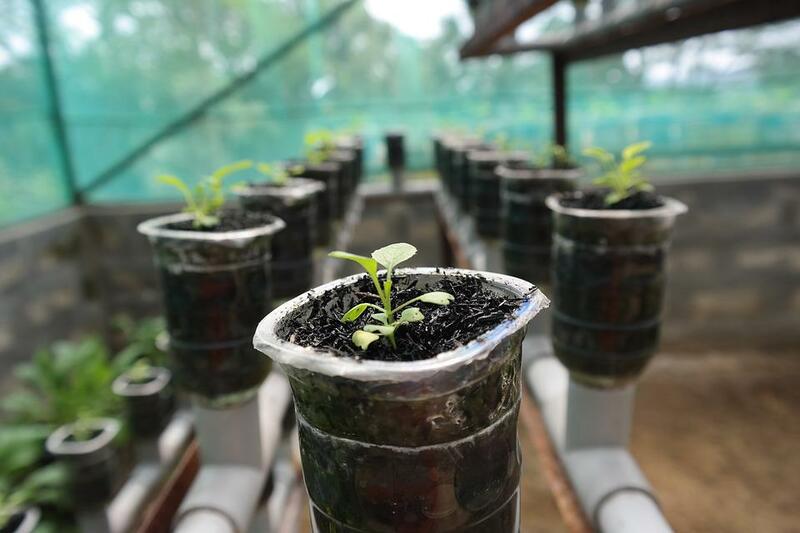 Just as a dirt farmer must determine the optimal fertilizer for the land and crops, the hydroponic farming practitioner must likewise understand which nutrients will optimally feed the plants. While plants will absorb hydrogen, oxygen and carbon from the water and air, they will derive the rest of their nutritional needs from the fertilizer, which must be soluble in water. Key to any purchase is labeling indicating that the plant food is specifically engineered for hydroponic growing. Before giving the solution access to the roots, make sure the fluid is around 70˚F, simulating soil temperature during the growing season. Coco – refers to either coconut fiber or coconut chips. From the husks of coconuts, this medium decomposes extremely slowly, providing practically no nutrients to the plant. This is actually a positive for hydroponic farming, where the solution is the exclusive source of plant food. If your plants require more oxygen, the larger coconut chips allow greater for aeration than the more finely gleaned fibers. Perlite – is a mineral compound that has the qualities of a sponge: light in weight, absorbent and full of pores. Because of its low density, it is considered optimal for wick systems but less so for ebb and flow. Rockwool – is a composite of granite and limestone that does not decompose. Its consistency is akin to steel wool or – more precisely – cotton candy. Its fineness, however, causes it to absorb water quickly; thus, it must be prevented from getting saturated, depriving the plants of food. Pine Shavings – are derived from kiln dried wood. They are inexpensive and easy to find in feed stores, nurseries and other outlets. One caution for gardeners is to confirm that the shavings are in fact kiln dried and possess no chemical supplements. Many hydroponic gardens are indoor operations. Lighting should be considered carefully for ideal growth. All light bulbs emit a range of colors: certain spectrums work better for some plants than for others. Accordingly, matching the lights to the plants’ needs will lead to the best harvest. For example, incandescent lights are a bad choice for hydroponic farming gardens because their spectrum does not correspond well to most plants (and the heat they emit is also problematic). On the other hand, fluorescent lamps are excellent for hydroponics. Those within the 6500k (Kelvin) spectrum are most recommended. Veteran growers like high-intensity discharge (HID) lamps as their light output is very high. Conversely, their heat output is also high, so gardeners must ensure that an effective cooling system is present. Light Emitting Diodes (LEDs) are the latest thing, and are considered the most cost-effective light sources. They last up to 50,000 hours on less electricity than the other lamps; produce little heat; and produce a light spectrum precisely related to specific plants. Factors affecting the choice of lights are varied: location, budget , plant selection and ventilation are all necessary components of a decision about lights. Why is the alkaline level so important in hydroponic farming? The amount of acidity determines how well the solution will traverse the cell walls of the plants and deliver the needed nutrition. The right balance of acid and base depends on the type of plant – and even the species within that type. The last step in creating a hydroponic garden, therefore, is ongoing testing. Fortunately, test kits are inexpensive and simple to use. Hydroponic farming and gardening may not be a panacea to the food demand versus environment dilemma. Still, it is a reasonable and promising way of reducing the stress on soil while meeting an increasingly swelling demand for food. Hey Buddy!, I found this information for you: "Hydroponic Farming: How to Build Your Own Garden". Here is the website link: https://backtofarm.com/hydroponic-farming/. Thank you.